Learn the fundamentals of modern calligraphy and how to use a brush and ink to hand write beautiful calligraphy and shapes. Tired of spending your working week in front of a computer screen? 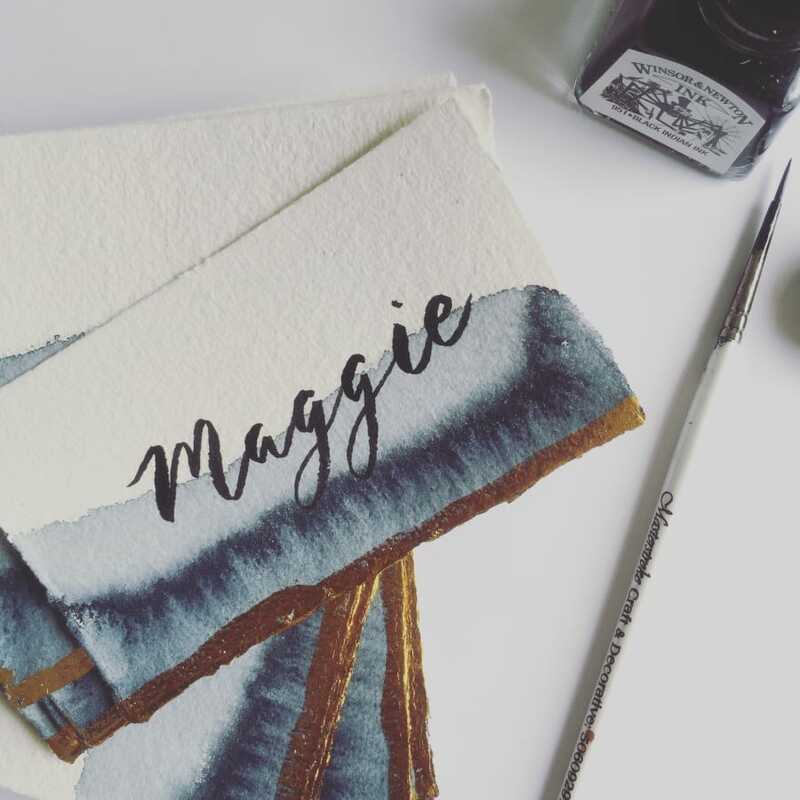 Why not have a go at learning a new creative skill like brush calligraphy? During the Babooche brush calligraphy workshop you will learn the fundamentals of modern calligraphy and how to use a brush and ink to hand write beautiful calligraphy and shapes. At a Babooche modern calligraphy workshop you will start off by learning and practising some basic strokes to get a feel of how to use your brush and ink before moving into the lower case alphabet and then capitals. You will then practise a phrase or quote in a lovely layout for your final piece which will be on an A5 thicker card. Something to take home and frame together with your brush calligraphy kit for you to practise away! The cost of a workshop includes a Babooche Calligraphy brush calligraphy starter kit to take home with you, together with light refreshments. Traditionally, calligraphy is used in conjunction with the illumination and/or decoration of the manuscript or book. There are many types of traditional calligraphy and illumination: early Egyptian papyrus manuscripts from the Renaissance pattern, oriental works created by brush, Islamic ornamentation and so on. It’s a very good size of class that you have a lot of interaction with the instructor - Asha. Asha has been very patient and will give you tips and advise how to write easier and better. Definitely recommend to anyone and I would definitely love to be back for another class! I had a lovely experience. Great teacher , lovely atmosphere. I will definitely do the next ones. Thanks. My husband and I attended Asha's amazing class and learnt so much. There were only 4 students which meant that we had lots of 1-2-1 support and feedback - all delivered with so much warmth. Asha also gave us tons of great tips and advice on supplies. We left with a beautiful pack filled with lots of useful exercises, a high quality brush and a pot of ink. We thoroughly enjoyed ourselves and can't wait to get practicing at home. This was a fantastic introduction to the art of brush calligraphy. Even in the space of two and a half hours I could see the difference in my technique. Only four people in each class means lots of attention from Asha. We got to take home a brush and high end ink to carry on practising. And there was chocolate…. Great, informative and enjoyable class. It is an intimate class which allows you some one on one time. The pack/starter kit is handy as has stencils, brush and ink to get you going. I am already looking forward to the follow up. Thank you Ash! Great class! Asha was a great teacher, very patient and gave the class a relaxed feel. Her worksheets and practice exercise were a great introduction before jumping into to a more personal attempt at Brush calligraphy. There was no pressure and all in all was a lovely way to get creative if you aren't naturally artistic! I would definitely recommend! Asha taught us the real basics and techniques of calligraphy. 2.5 hours really made a difference to my calligraphy skills (btw I had zero calligraphy experience). What a great class. I had a wonderful time leaning the basics of brush calligraphy. It was a small group and the teacher was amazing. I left the class super inspired. What a lovely way to spend an afternoon. Learning how to create beautiful lettering. Highly recommend this course. The classes are small so it is easy to get the attention you need to perfect your technique from the tutor. I will be booking on the improver course next and will also try my hand at the modern calligraphy course. I really enjoyed the workshop. The studio and the materials were all amazing, and Asha was very knowledgable and helpful throughout the session. Thank you! Class started on time, class size is small (6pax) so there is a lot of attention by the teacher to correct you. Aisha is patient with all students and engages all students during the class. We learnt calligraphy with both pen brush and paint brush. It was amazing workshop!The workshop was very organized and the teacher was professional, also kind and helpful.Brush Calligraphy was a little bit difficult for beginners as me and it was hard to master it for this short session but it was really fun. Asha is such a lovely lady and a really great teacher. I thoroughly enjoyed the brush calligraphy lesson! With a small group, Asha was able to focus on each student individually, encouraged our designs and way of writing and demonstrated beautifully (while making it look a little too easy). Have recommended it to my fellow crafty friends and would recommend to everyone! The class was great! Great location and ambience. Asha was very patient and I learned a lot! I am definitely taking her other classes. Wonderful class. The studio was very easy to find and Asha was very welcoming. It was lovely to learn a new skill! I have already been practising since the class. I would recommend to anyone who wants to give Brush calligraphy a try or just wants to be creative for an evening. I got an Obby voucher to spend on the class which I would also recommend. Absolutely loved Asha's class and the new skill I now have! The class was intimate and jam-packed full of knowledge. Was a good progression of simple techniques through to a finished product. Will be practicing, practicing and practicing some more at home now. The workshop was fun, insightful and well thought through! Whatever ability you are supported and guided on how to improve. I would recommend this workshop to anyone, from someone who is a complete beginner or someone who needed some tips and tricks to further develop! My name is Asha and I am the creator and owner of Babooche Calligraphy. 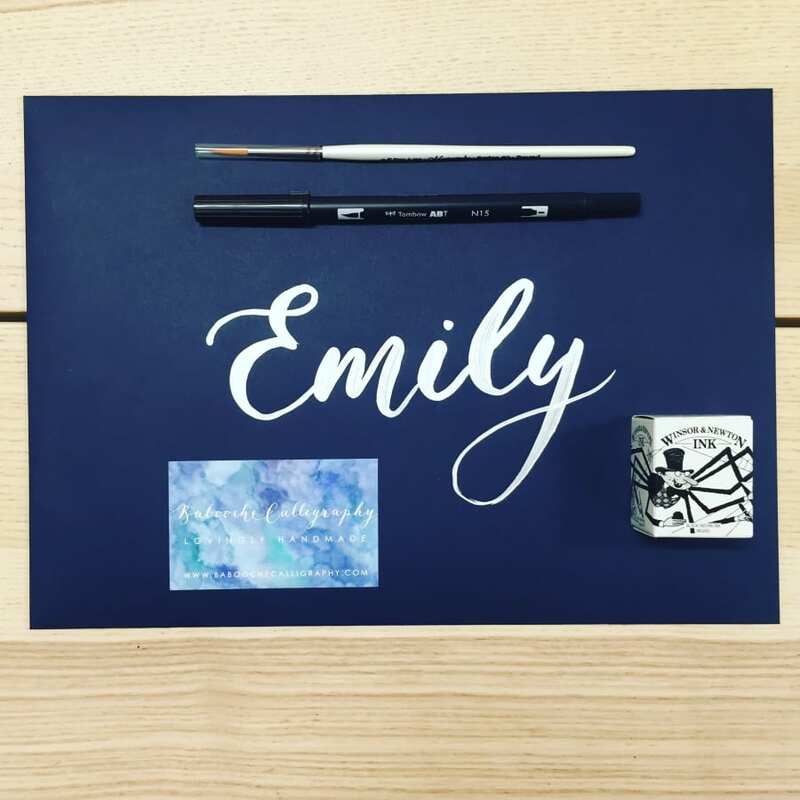 I specialise in custom calligraphy, illustration and stationery for weddings, special events and small businesses. I am inspired by the sea and nature and my motto is “lovingly handmade, simple, natural and timeless”. 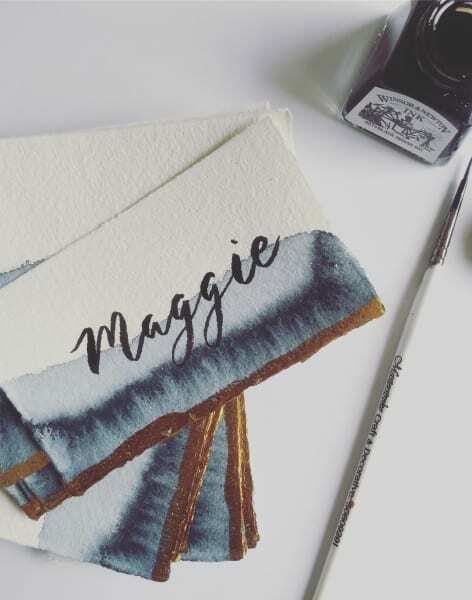 Growing up by the sea and surrounded by British countryside, my aim is to bring a sense of fresh air and calmness for brides and businesses looking for simple design and elegant calligraphy. When I am not busy in the studio working on orders and creating new pieces with my beautiful tools, I love to travel and explore the world and learn about different cultures and people.